Adult apterae of Uroleucon leontodontis are shining brown with black antennae and siphunculi and a yellow cauda. The antennae have a terminal process 5.1-6.7 times longer than the base of antennal segment VI (cf. Uroleucon picridis which has a terminal process 4.4-5.8 times longer than the base of antennal segment VI ). The apical rostral segment (RIV+V) is long and slender, and 1.32-1.57 times the length of the second hind tarsal segment (HTII) (cf. Uroleucon cichorii and Uroleucon grossum where RIV+V is 1.04-1.35 times the length of HTII). The hind coxae are dusky to dark, like the distal parts of the femora (cf. Uroleucon picridis which has the hind coxae much paler than the distal parts of the femora). The siphunculi are 1.3-1.8 times the length of the cauda, with reticulation on the apical 24-30%. The cauda has 17-24 hairs. The body length of the adult Uroleucon leontodontis aptera is 3.2-4.3 mm. The Uroleucon leontodontis alate (see second picture above) has only been described fairly recently by Depa & Mróz (2012). The body is shiny dark brown, and the antennae are dark. The legs are black except for the basal parts of the femora, the siphunculi are black and the cauda is yellow. The apical rostral segment (RIV+V) is long and slender, and 1.3-1.6 times the length of the second hind tarsal segment (HTII). The micrograph below is a ventral view of an alate Uroleucon leontodontis in alcohol. Uroleucon leontodontis is often recorded as occurring on all hawkbits (including Scorzoneroides autumnalis ) although, given its evolved adaptation of an extra long apical rostral segment (see below), it seems more likely that it is largely restricted to bristly hawkbit (Leontodon hispidus), lesser hawkbit (Leontodon saxatilis), hairy hawkbit (Leontodon hirtus) and Leontodon crispus, all of which have trichomes on their stems. Oviparae and alate males occur in September & October. Uroleucon leontodontis is found in Britain and continental Europe. The host range of Uroleucon leontodontis is still unclear. 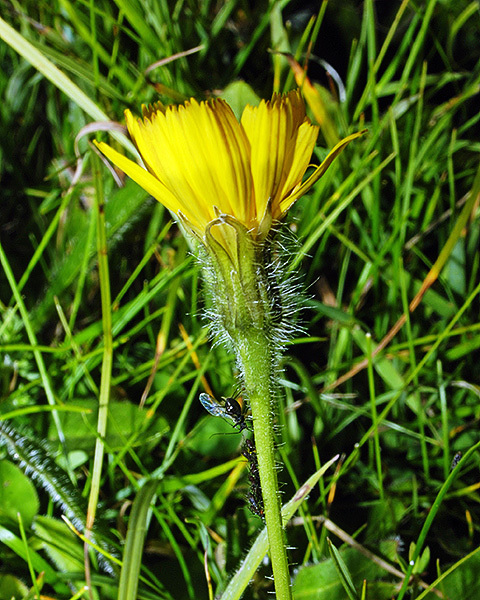 Heie (1995) states unambiguously that the host plant is Leontodon hastilis, now regarded as a synonym of the bristly hawkbit (Leontodon hispidus). This plant is characterized by the leaves, stems and buds being covered in numerous hairs (see first picture below). We have also found the aphid on what appears to be the lesser hawkbit (Leontodon saxatilis, see second picture above), although this could be a hybrid plant (Leontodon hispidus x saxatilis) or an aberrant Leontodon hispidus. 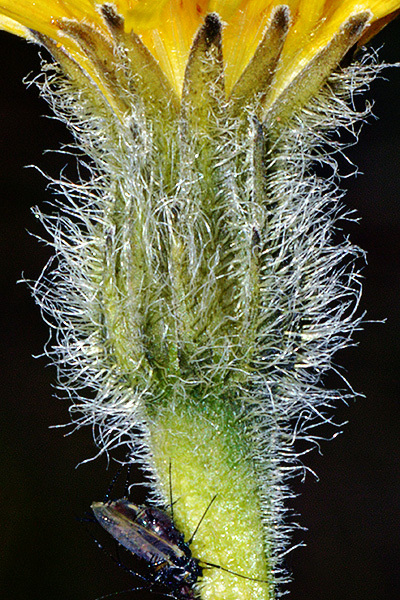 Note all the hairs have forked tips, characteristic of Leontodon hispidus and Leontodon saxatilis. Blackman & Eastop records Uroleucon leontodontis as occurring on three species of the genus Leontodon and on the (non-hairy) Scorzoneroides autumnalis. We think the latter is unlikely (or at least very rare) given the proposition by Moran (1986) that Uroleucon aphids have adapted morphologically to the different selective regimes imposed by certain characteristics of the plant surface. 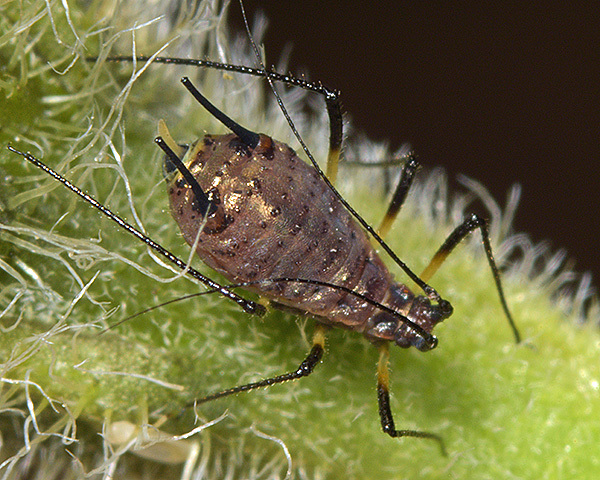 Those characteristics, including hairs, glandular hairs, scales and papillae (known collectively as trichomes) are known to affect feeding success of aphids. In general Moran has suggested that the hairier the plant surface, the longer the apical segment of the aphid rostrum. Both Blackman (2010) and Heie (1995) use apical rostral length to differentiate some of the closely related Uroleucon species. More precisely they use the ratio of the length of the apical segment of the rostrum (strictly speaking the fused last two segments) to the length of the second segment of the hind tarsus, which gives the standardized rostral length. Uroleucon hypochoeridis occurs on plants with either smooth (glabrous) stems or very short hairs such as Hypochaeris spp. and Leontodon autumnalis, and has a standardized rostral length of 0.84 to 1.08. Uroleucon grossum occurs on the upper parts of Crepis spp. which have distinctly hairy stems and bracts, and has a standardized rostral length of 1.04 to 1.33. Uroleucon leontodontis has the longest standardized rostral length at 1.32 to 1.57, and occurs on Leontodon hispidus, and other long-haired members of the genus. 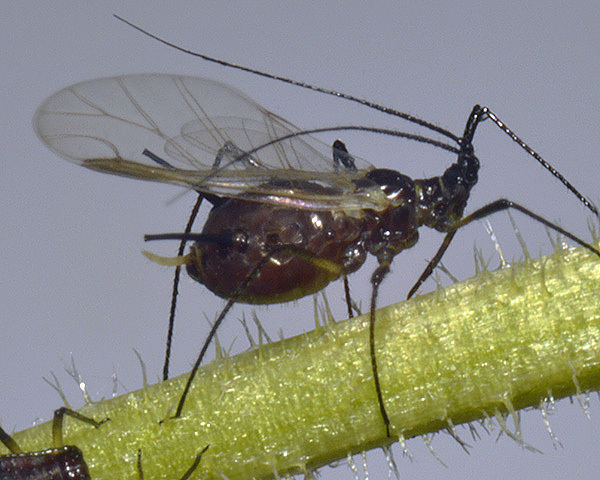 Note that despite its longer rostrum apex, the aphid is still apparently selecting an area of stem where the hairs are somewhat shorter, certainly markedly shorter than those on the flower head itself. 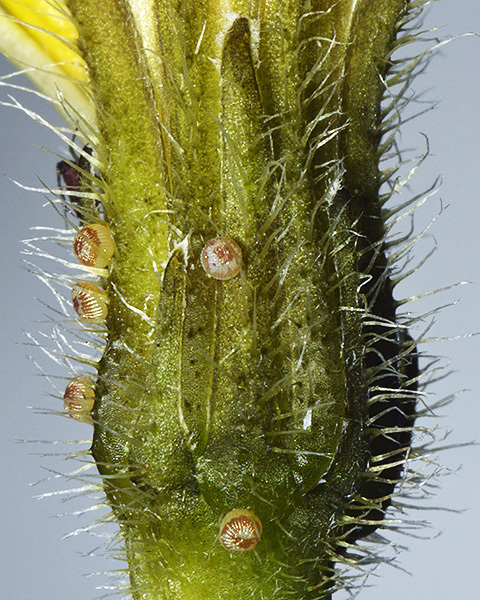 In this site, the body can easily be held clear of the trichomes even whilst feeding. 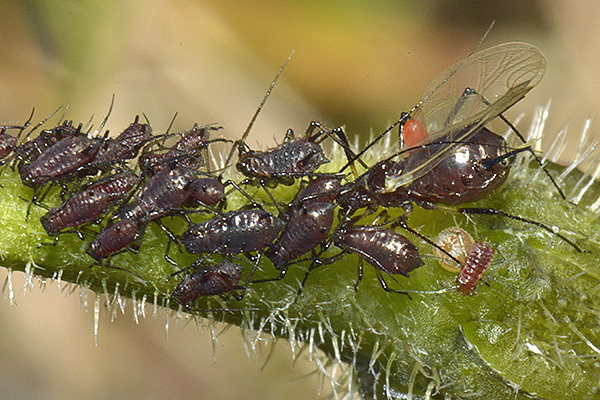 The choice of feeding site may well be made more to benefit the aphid's offspring which tend to remain close to the parent aphid, as can be seen in the picture below. We have only found Uroleucon leontodontis a couple of times, so we cannot assess the range of predators which may attack them. But as is common for Uroleucon species, we have found specimens being parasitized by larval velvet mites (Trombidiidae) (see alate in picture above). 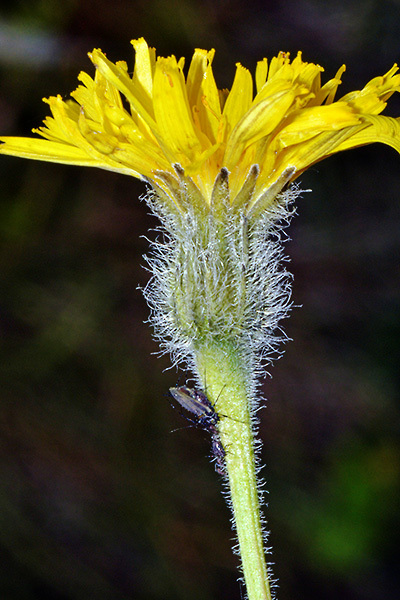 Uroleucon leontodontis has been recorded from three species of Leontodon: Leontodon crispus, bristly hawkbit (Leontodon hispidus), and hairy hawkbit (Leontodon hirtus) and (questionably) from autumn hawkbit (Scorzoneroides autumnalis). Blackman & Eastop list 29 species of aphid as feeding on those four species of hawkbits (Leontodon & Scorzoneroides) worldwide, and provide formal identification keys. 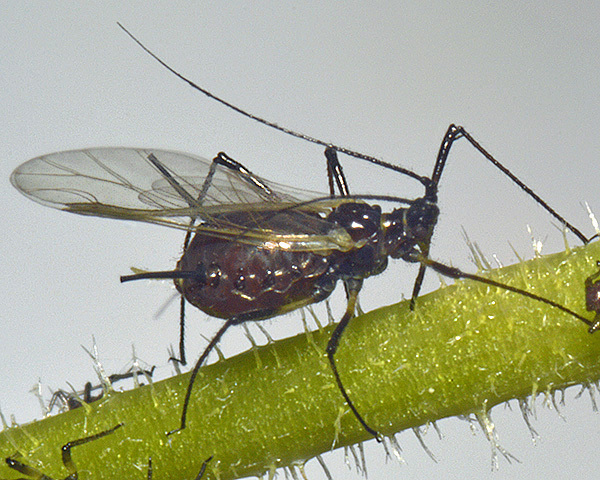 Of those aphid species, Baker (2015) lists 25 as occurring in Britain: Aphis craccivora,, Aphis fabae, Aphis gossypii, Aphis nasturtii, Aphis solanella, Aphis spiraecola, Aulacorthum palustre, Aulacorthum solani, Brachycaudus helichrysi, Hyperomyzus lactucae, Myzus ascalonicus, Myzus cymbalariae, Myzus ornatus, Myzus persicae, Nasonovia ribisnigri, Protaphis terricola, Protrama flavescens, Trama caudata, Trama troglodytes, Uroleucon cichorii, Uroleucon hypochoeridis, Uroleucon leontodontis, Uroleucon picridis, Uroleucon sonchi and Uroleucon taraxaci. Blackman, R.L. (2010). Aphids - Aphidinae (Macrosiphini). Handbooks for the identification of British insects 2(7). Royal Entomological Society, London. Heie, O.E. (1995). The Aphidoidea (Hemiptera) of Fennoscandia and Denmark. 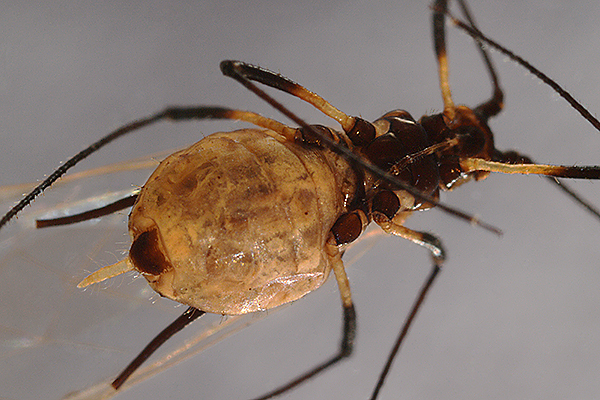 Part 3 of the tribe Macrosiphini of subfamily Aphidinae, and family Lachnidae. Fauna Entomologica Scandinavica 31. E.J. Brill.